MOSCOW, Russia -- Not so long ago, the ultranationalist broadsheet "Zavtra" would occasionally pillory Russian President Vladimir Putin for various sins. Andrei Fefelov, an editor at "Zavtra," in his Moscow offices. But that all changed with Russia's annexation of Crimea and support for pro-Moscow separatists in eastern Ukraine. "With Crimea joining [Russia], Putin suits us. Putin is even an inspiration to us,” says Andrei Fefelov, an editor at "Zavtra" and the son of the newspaper's founder, Aleksandr Prokhanov. "We didn’t expect such steps from Putin. We didn't expect such a strategy. The Russian state is once again rising like a phoenix from the ashes." Likewise, over the past several months, "Zavtra," once on the fringes of Russian political discourse, has found itself firmly in the mainstream. Prokhanov, for example, makes regular appearances on state-controlled television stations and his articles are published in newspapers like the fiercely pro-Kremlin daily "Izvestia." Prokhanov and "Zavtra" haven't changed. The newspaper, which claims a circulation of between 70,000 and 100,000, is still pushing the same visceral anti-Western views and neo-Stalinist views it always has. What has changed, however, is Russian politics, which have taken a decisively nationalist and imperial turn during Putin's third term in the Kremlin. "Yesterday's political marginals have become today's mainstream," said Yevgeny Kiselyov, who hosted the popular current affairs program "Itogi" (Summing Up) on Russia's NTV channel in the 1990s before falling out with Putin’s Kremlin and emigrating to Ukraine. “It's clear that many of the ideas that were propagandized by Prokhanov...have become to an extent practically the principal line of Russian foreign policy." "Zavtra," which means "Tomorrow" in Russian, traces its origins back to the newspaper "Den," or "The Day," founded by Prokhanov in 1990 in the dying days of the Soviet Union. In the early 1990s, it billed itself as "the spiritual opposition" to the pro-Western government of Boris Yeltsin, Russia's first post-Soviet president. Following Yeltsin's bloody confrontation with hard-liners in the Russian parliament in October 1993, "Den" was shut down by the authorities. But it was soon resurrected as "Zavtra," with Prokhanov still at the helm. It continued to be a hotbed of the "red-brown" ideology, a fusion of nationalism, monarchism, and nostalgia for Soviet Communism. The newspaper's staff describe their mission as providing an "ark" to preserve what they believe are the best elements of Russian identity -- Orthodox Christianity, Stalinism, authoritarianism, and nationalism. 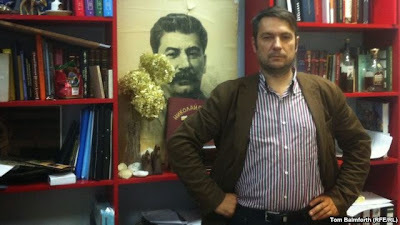 Anton Shekhovtsov, a visiting fellow at the Institute for Human Sciences, describes "Zavtra" as "a fascist newspaper." At the newspaper's Moscow headquarters, portraits of the Russian tsars and Soviet leader Josef Stalin adorn the walls. Throughout the Yeltsin years, "Zavtra" remained on the margins and in fierce opposition to the Kremlin. But when Prokhanov met Putin just months into his presidency in August 2000, he saw reason for hope. "The Kremlin is once again mine, once again part of the family," he wrote in the weekly tabloid "Argumenty i Fakty." But at times Putin proved to be a disappointment for Prokhanov and his ideological cohorts. In 2005, the broadsheet scorned the president for serving only liberal “fundamentalists” taking from the people to enrich the oligarchs. "My views on Putin gradually evolved,” Prokhanov said in a recent interview. "Slowly and cautiously, I began to realize what was happening was the restoration of the state. The most obvious moment was his victory in the second Chechen war." But it was with the Ukraine crisis that "Zavtra" threw its support fully behind Putin's Kremlin. Two of the paper’s alumni, former staff writer Aleksandr Borodai and contributor Igor Girkin, took up leading positions in the Russia-backed separatist campaign against Kiev. Borodai served as the self-anointed prime minister of the self-proclaimed Donetsk People's Republic before he suddenly resigned on August 7. Girkin -- also known as “Strelkov” -- was the rebel commander until resigning on August 14 following unconfirmed reports that he had been injured in battle. Fefelov says "Zavtra" readers view Ukraine’s Donbas region -- part of what Russian nationalists call “Novorossia,” or "New Russia" -- as a potential paradise where communist, nationalist, and monarchist visions of Russia can be played out without being hamstrung by the restraints the real Russia faces. He adds that “many friends and readers” approach "Zavtra" to enlist as volunteer fighters in eastern Ukraine. The newspaper, he adds, has helped link them up with recruiters. Nikolai, a 60-year-old Muscovite and Zavtra reader who declined to give his surname, related his experience as a volunteer fighter in Luhansk. He said he was there two months and manned checkpoints. He presented a photo of himself clutching an assault rifle standing in camouflage beside a frocked, armed, and bearded Orthodox priest. He said he had only returned to Moscow to fetch humanitarian aid for the region. Prokhanov, for his part, says he had a one-on-one meeting with Putin at his Novo-Ogaryovo residence on July 30. "It convinced again that my very first meeting with Putin did not deceive me," he said. Putin's March 18 speech following the annexation of Crimea echoed many of the issues "Zavtra" has long advocated, including Moscow's obligation to protect all ethnic Russians, not just Russian citizens. Nevertheless, Shekhovstov cautioned against overstating the newspaper's drift into the mainstream. "They are becoming more acceptable to the mainstream, but they are not becoming part of it," he said. "There is still a distance between the Kremlin’s ideas of Russian nationalism and Russian imperialism, and the version that 'Zavtra' proposes." With Ukrainian forces gaining ground on the separatists in the east and as Western sanctions begin to harm the Russian economy, is there concern at "Zavtra" that Putin might ditch the rebels and abandon the Novorossia project entirely? Not a chance, says Fefelov. "It would be lethal for Putin," he says. "You can't move a pawn backwards." In fact, the headline of a recent article by Prokhanov appeared to relish a protracted conflict with the West. “Hello Cold War!” it read. "Российских артистов и так уже давно нет в Украине, - заявил ForUm’у продюсер Тимофей Нагорный. – Поэтому это решение глупое. Нужно, наоборот, сконцентрировать свое внимание на тех россиянах, которые поддерживают Украину, и именно их приглашать. Например, Андрей Макаревич в своей гражданской позиции всегда поддерживал нас, вот таких людей и нужно звать. А на остальных не обращать просто внимания». С Нагорным согласен его коллега, продюсер Вадим Лисица. Он уверен, что украинцы сами покажут свое отношение к тому или иному артисту. «Наши люди неглупые. Ведь публику не обманешь, и, естественно, она отреагирует сама, без всяких санкций, - сказал он нам." I would agree with the quote above. In cases, where event has Ukrainian Government participation, Government will decide in each case whether invite some one or not. Some actors who are active in anti Ukrainian propaganda and regularly comment or publish articles, books or other materials for separatism in Ukraine, space in mas-media such as TV, Radio, Theaters and others should not be provided. It does not make scene to provide a platform for those fascists from Russia in Ukraine, just as Germany's democracy in 1930th allowed radicals to come to power. Because such forces, artist or not artist is a radical forces, and Ukraine need a break from them. Perhaps such restrictions will be clearly temporary for a period of time and each case reviewed independently every five years or so.